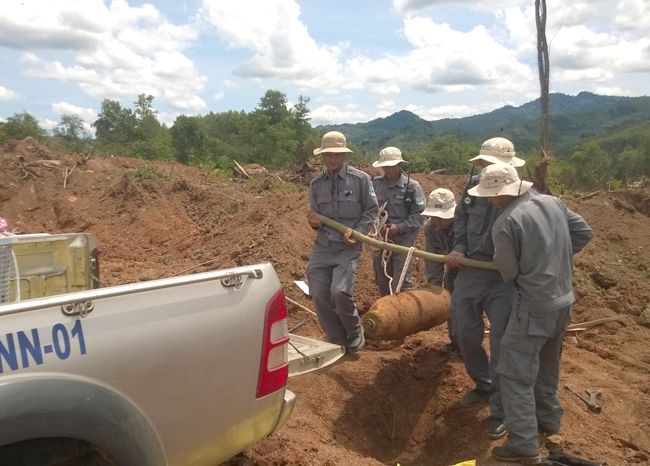 A Project RENEW EOD team today safely removed an unexploded U.S. aerial bomb from a new resettlement zone under construction in Ta Rut Commune of Dakrong District, Quang Tri Province. The bomb was discovered at a depth of about 1.5 meters by an excavator operator who was grading and leveling the ground yesterday afternoon. RENEW EOD team members loading the 250-pound bomb onto their truck for transport to the demolition site. 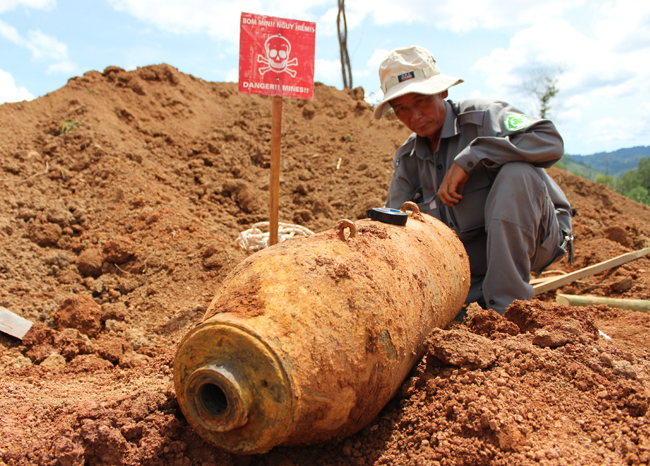 According to the construction site supervisor, Tran Anh Tuan, discovery of the huge bomb was a shock to the workers, because this 22-acre site had been cleared of ordnance before the site preparation began, as required by regulation. “We found no wartime ordnance on the site until we expanded into the outer area where local ethnic people used to grow cassava,” said Tuan. Located along the axis of the Ho Chi Minh Highway, which roughly follows the legendary Ho Chi Minh Trail, Ta Rut Commune is 50km from the district center and is mainly inhabited by two ethnic groups, Van Kieu and Paco, who earn their living by slash-and-burn agriculture and raising small livestock. The new resettlement site, which has been under construction for nearly one month, will accommodate families in the commune who currently live in risky, flood-prone areas. Tuan called to report their discovery Dakrong District’s Military Command. 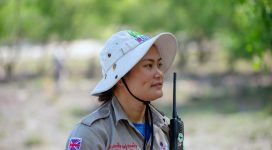 Major Nguyen Van Thanh, Project RENEW’s Military Liaison Officer, promptly coordinated with Project RENEW to plan quick response action to this emergency call. RENEW’s EOD Team found the bomb lying half exposed on the ground. 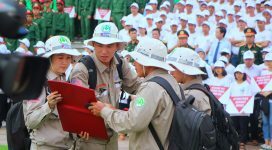 Project RENEW’s EOD team, accompanied by Major Thanh, arrived at the site early Friday morning after traveling more than 100km from Dong Ha City to mountainous Ta Rut Village. 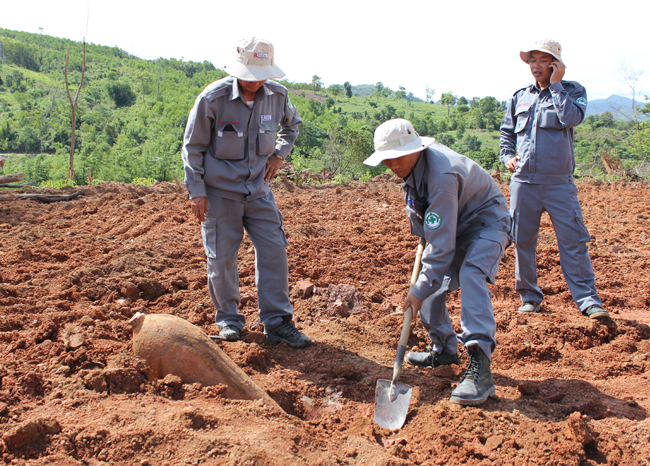 Upon arrival, National Technical Officer Bui Trong Hong directed the team members to carefully remove earth to fully expose the bomb so he could start his investigation. National Technical Officer Bui Trong Hong investigating the condition of the bomb to decide whether it is safe for the team to remove it or to destroy it in place. The bomb was identified as a U.S. General Purpose 250LB AN-M57 which was dropped by the U.S. Air Force more than 40 years ago. 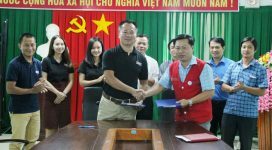 Since it was safe to remove, Mr. Hong ordered team members to transport it to RENEW’s Central Demolition Site in Trieu Phong for later destruction. With support from Norwegian People’s Aid (NPA), Project RENEW has expanded mine action operations into Dakrong District since July 2013. Technical teams have surveyed 3.1 million square meters for cluster munitions and identified 16 Confirmed Hazardous Areas consisting of 265,000 square meters that need full clearance. As a result, 252 items of cluster munitions and other explosive remnants of war have been safely removed and destroyed so far.